There's no doubt about it, February sunshine is strong enough to warm the gardener’s back and conjure up thoughts of summer. Warmer weather and longer days mean fresh, tender vegetables and sun warmed fruit. One of the most iconic and delicious culinary treats is asparagus and it's been widely grown in Britain since the 17th century. The Huguenots, who fled political persecution in France in 1685, planted fields of it in Battersea and two hundred and sixty acres were once devoted to the crop. 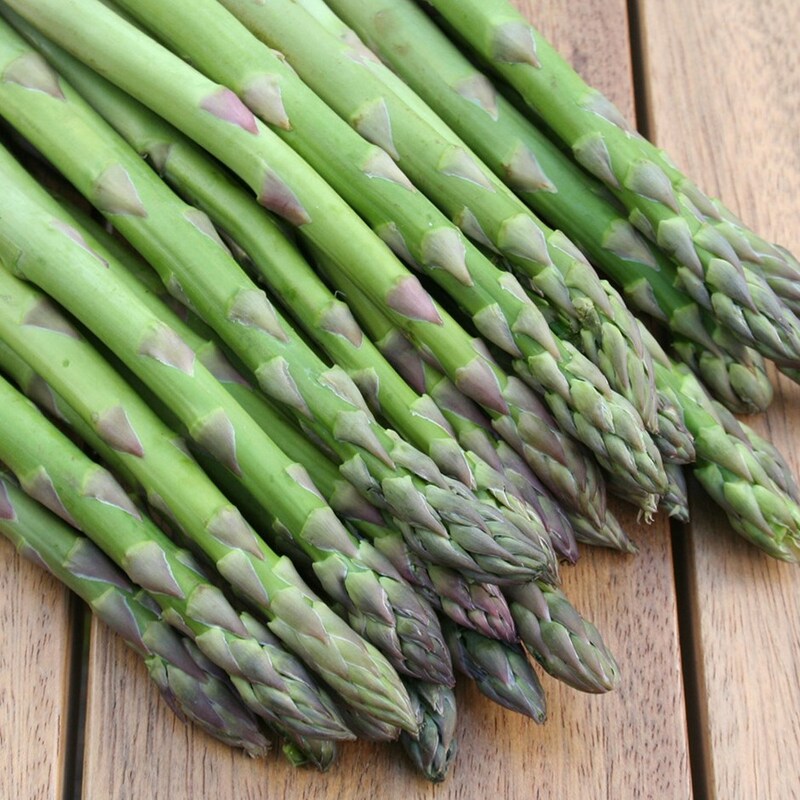 Battersea asparagus, grown close the River Thames, was considered the best of all. These days the area round Evesham in Worcestershire, close to the River Avon, is the asparagus centre. 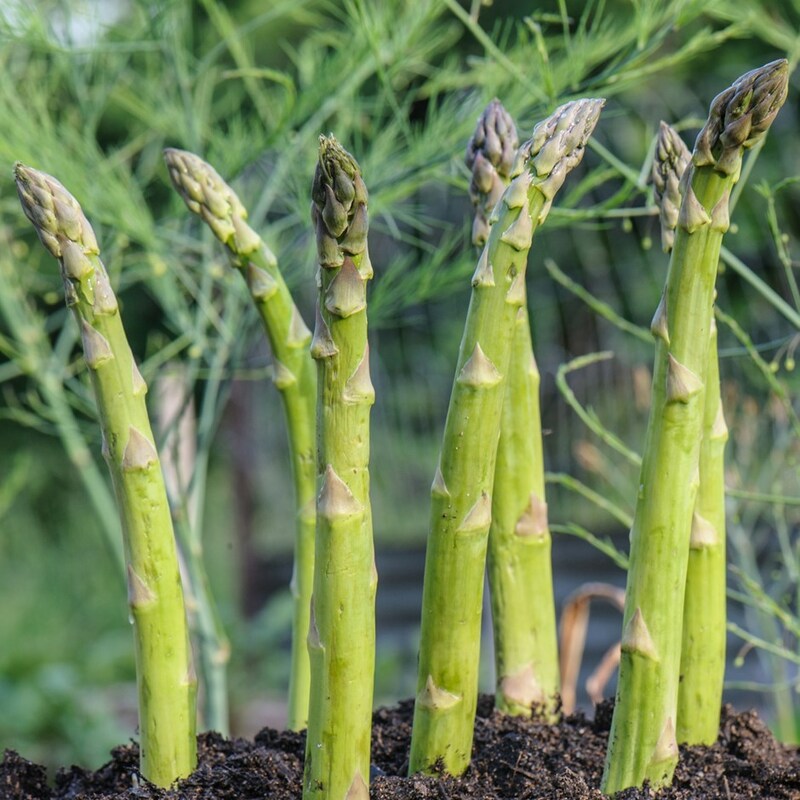 Although asparagus favours alluvial soil and warmth, it’s surprisingly adaptable on improved soil. Consequently it soon became a stalwart of the walled kitchen. This was principally due to its sense of timing, for it’s able to produce a crop when there’s little else about. 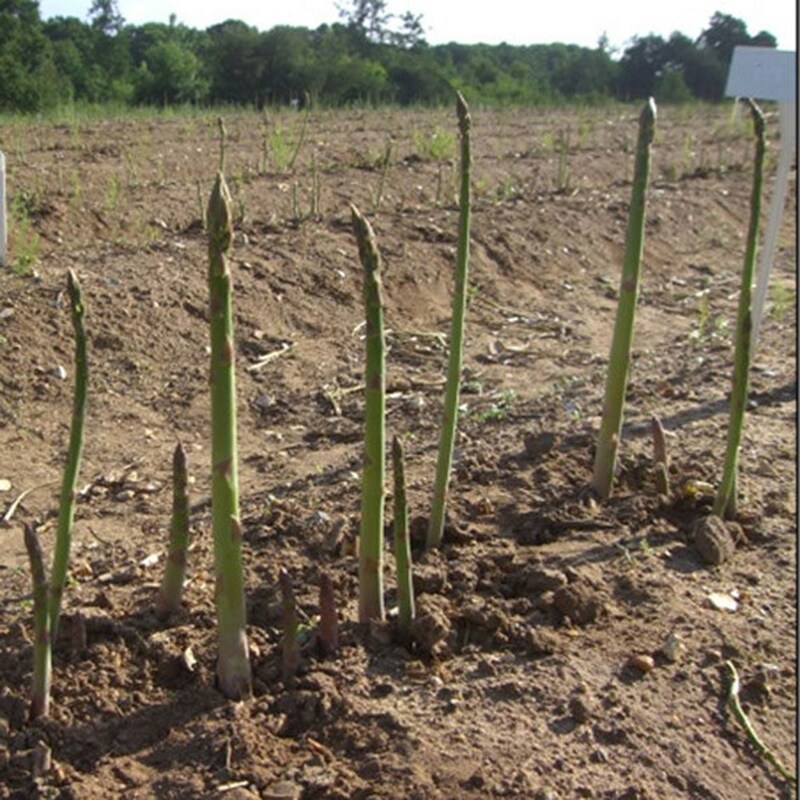 By April and May asparagus is racing upwards and producing six weeks of spears. You can harvest every 2 -3 days in warm weather when each spear measures 18cm (6 -7 inches) in length and using an asparagus knife, which has been specially designed for the job, cut the spears around 2.5cm (1") below ground level. It’s traditional to stop cutting on Midsummer's day or June 21st, or thereabouts, to allow your plants to regenerate for next year’s crop. By then the summer vegetables are in. 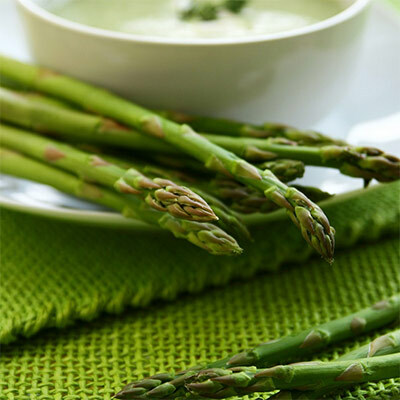 It's an unusual vegetable in another respect, because asparagus is perennial and can live for up to 50 years. Once planted, it will take four years to crop properly, if you start with crowns or ready grown plants. 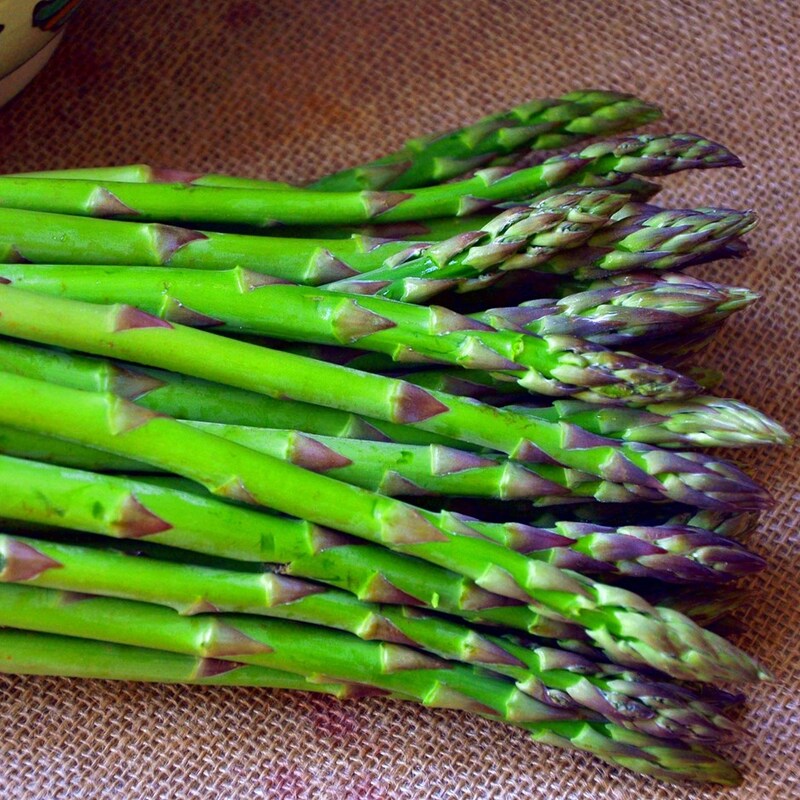 Asparagus spears can be male, or female, and it's the male spears that are the thickest. 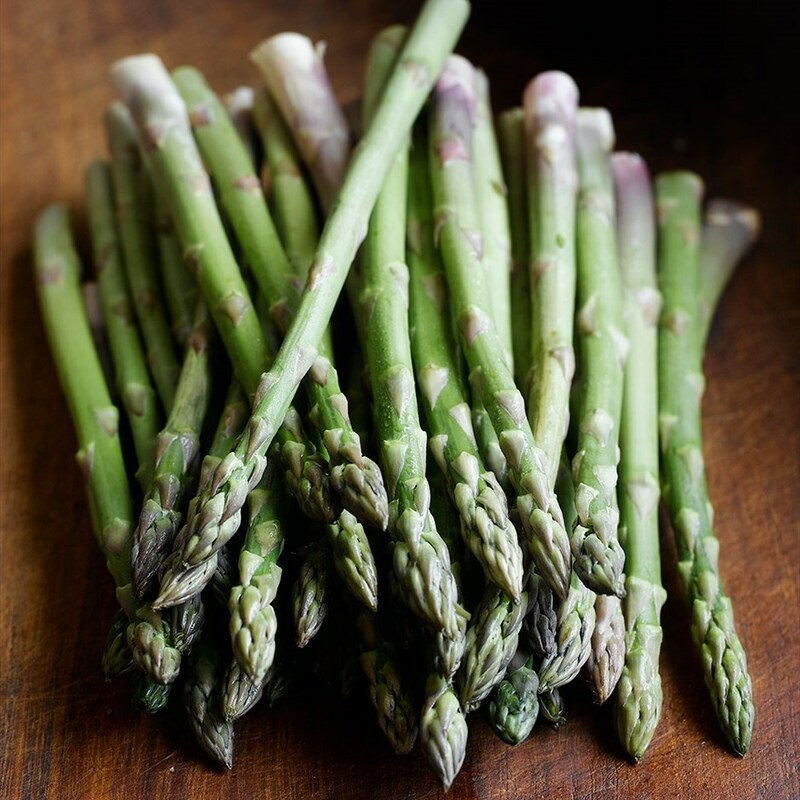 The name asparagus comes from the Greek spargao, meaning turgid. Many varieties are all male because female spears are much thinner and they produce berries. It’s best to cut away these thinner, berried stems before they self-seed. If you've got room, plant 20 or 30 crowns and, if drainage is poor, create a raised bed or mound of soil. March and April are the best months to plant asparagus crowns and these can be soaked in water for a couple of hours just before planting. Choose a weed free, sunny site or one that enjoys dappled shade. If you’ve a sloping plot put it on the upper part, because asparagus can get frosted on low lying ground. Dig a trench 30cm (12in) wide and 20cm (8in) deep and work in well-rotted manure, or garden compost, into the bottom of the trench. Cover the base with a 5cm (2in) layer of the excavated soil and then make a 10cm-high (4in) ridge of soil down the centre of the trench. Place the crowns on top of this ridge, spacing them 30-45cm (12 -18in) apart within the row. Spread the roots evenly, so they resemble multi-legged spiders, and replace the rest of the soil, leaving the bud tips just visible. Water well. If you’re on acid soil, add lime before planting. Don’t harvest any spears for the first three years and protect from rabbits. Keep an eye out for out asparagus beetles: they look like elongated ladybirds. They lay their eggs on the foliage in June. Pick any off and destroy them, checking regularly for more. Leave the top growth intact until it begins to fade and then cut back to one inch above the ground. Never hoe asparagus, hand weed it instead because it’s shallow rooted. Avoid thick mulching and always feed in March, with a slow release fertiliser. Feed again in June if you think your crop needs a boost. Kept weed free and well fed your crop will thrive. This early cropping, heritage variety was launched in 1872. 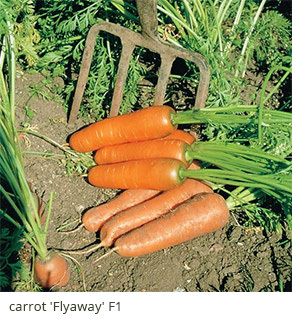 Known for being adaptable, but it prefers lighter soil. Includes male and female plants. 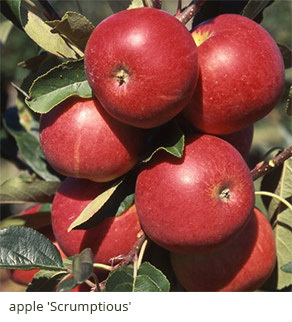 A high yielding New Zealand variety, bred for its sweetness and tenderness. It can be cooked or eaten raw. 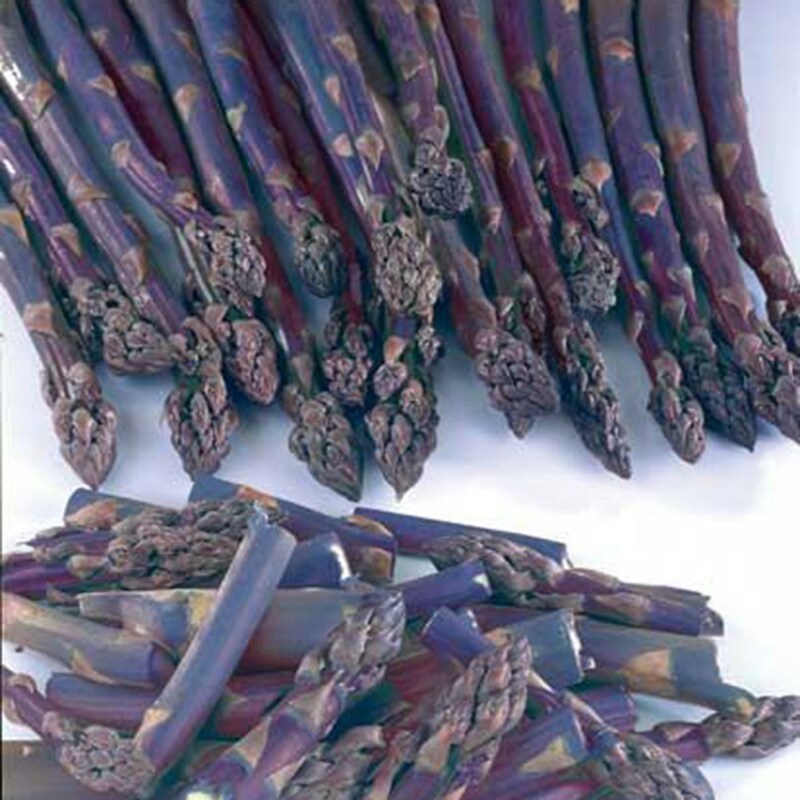 Purple spears turn dark green when cooked. Purple varieties contain 25% more sugar along with more antioxidants. An early season F1 variety, That's high yielding male-dominant. 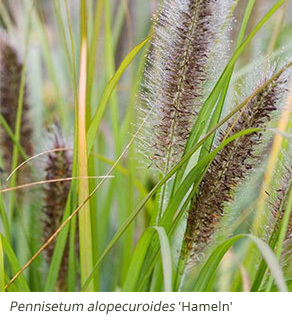 Produces medium thick, mid-green spears with purple tips.Can be raised from seed. An early, male dominant F1 variety that produces a bumper crop of high quality spears with a strong flavour. Cook it or eat it raw. Raised and commercially grown in Northern Germany so should do well in colder areas. An all male, cold tolerant variety widely used by British commercial growers for its heavy yield of uniform spears later in the season. An F1 variety raised in Canada at the University of Guelph in Ontario. Adapted to cooler, temperatures and colder winters. The exceptionally flavoured green spears of this F1 variety appear relatively late in the season. The green tight headed spears are particularly tender and can be sliced in salads, or cooked. The plants could be either male or female. Cut back late summer flowering clematis to lowest shooting buds. The ‘viticella’ clematis produce an abundance of smaller flowers on new wood, but the golden rule is that if any clematis flowers in July and August - cut it back. 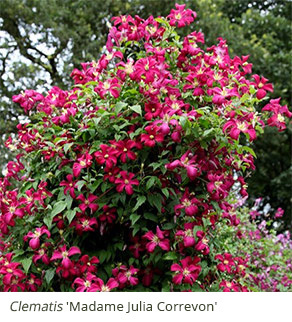 Every clematis will come with a label indicating either Group 1 (no prune), Group 2 (light prune) or Group 3 (hard prune in spring). Keep this label in a safe place to avoid confussion. Prepare vegetable beds ready for spring planting. Winter digging (usually done in the autumn) involves turning the soil with a fork and allowing the clods to break up as they freeze and thaw. Rake these areas now, but do use a board to stand on so that you don’t compact the soil. 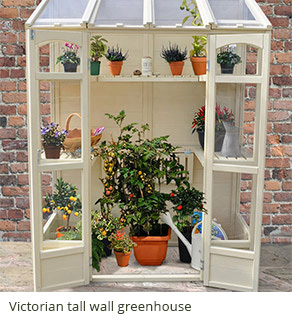 Wash greenhouse glass to maximise light. Wash down your paths and paved areas as well. Trim back late season grasses and perennials now and weed between them. Many will soon shoot and these can be divided in spring, as they spurt into growth. Use the outer pieces of perennials: they are more vigorous. Either pot up, or replant. Split grasses into good chunks and replant. Finish all woody pruning of apples and pears. Aim for an open airy shape. Start by removing the 3Ds - dead, diseased and dying wood. Remove any branches that cross over. Trim the leading stems on apples and pears by up to a third.